A new lease of life for Italy's aqua vitae? The French have brandy, the Scots and the Irish have whisk(e)y and the Italians have... grappa. Outside Italy it's often been seen as a rough old stomach-­burner, and even inside Italy it's not exactly fashionable. But could this ancient drink be on the verge of a revival? It's been used as an anaesthetic, a disinfectant to clean wounds (like bourbon in Western movies), and a treatment for intestinal worms. It was the liquid courage carried in Italian soldiers' flasks in World War One to sanitise their drinking water, warm them up and lift their spirits. And you can still find World War Two veterans who remember drinking grappa before an assault. Made from the pulpy residue left after pressing grapes for winemaking, grappa was traditionally distilled by farmers who,­ according to alcohol historian Fulvio Piccinino, never like to throw anything away. "In the past, everyone made it and it was drunk by all the family. At the end of a meal, you had grappa," says Piccinino, who comes from a tiny village in Piedmont which was famous for having 16 distilleries. "My uncle used to drink two litres of wine per day as well as grappa! You used to work outdoors and needed to warm up." But things changed when people went to work in factories - to operate machinery they had to be completely sober. "If you worked in vineyards you could have a couple of grappas, no problem," Piccinino says. "Nowadays you have to go to the office." When Piccinino worked as a barman 20 years ago about half the coffees people ordered were caffe corretto - espresso with a 1cl shot of grappa. A shot of grappa may also be drunk alongside the coffee as an ammazzacaffe (literally, a "coffee killer") the idea being that the alcohol - which has sedative properties - contrasts with and cancels out the effect of the caffeine - a stimulant. The popularity of caffe corretto had already been waning since the 1980s, however. And as families lost the habit of eating together, grappa consumption went into decline. It became seen as an old person's tipple. "The young are very sensitive to fashion, and vodka, gin and rum became fashionable," says Piccinino. "You never see a young guy ordering grappa to impress a girl. Grappa is not cool." The drink dates back to the 15th Century, and possibly earlier. It's the Italian member of a family of spirits named "water of life", historically believed to have curative properties. While its common name is "grappa", the drink's formal title is acquavite di vinaccia, derived from the Latin aqua vitae, or "water of life" (di vinaccia means "made from grape pulp"). This makes it a cousin of the French eau de vie - a term applied to some types of brandy - Scandinavian akvavit, and whisky too. The word "whisky" comes from whiskybae, originally usquebaugh, an Anglicised version of the Irish and Scottish Gaelic versions of "water of life" (uisce being "water" and beatha "of life"). Vodka too, is a diminutive form of the Russian word for water, voda, so can also be counted a relative. Piccinino likes to think that grappa is the oldest of all. Pulped grapes, known as pomace, were given to peasants by feudal lords as part of their salary, he says. There is a 1443 document that refers to a tax on a grape brandy, which he takes as a reference to grappa, but he is still searching for documentary evidence that the drink is older than Armagnac, which was first distilled in the late 14th Century. "Unfortunately there's no record because it was made by peasants rather than literate monks or friars," he says. "As we say in Italy, 'carta canta e villan dorme' - paper sings and farmers sleep." The grappa of today is very different from that of 50 years ago, let alone 500. Many distilleries have turned their back on the rough rocket-­fuel grappas of old and Piccinino thinks this new smoother version of the drink may be about to stage a comeback. "Before, if you smelled it, it was very crude and strong. Now they use different types of stills to create a more refined aroma and softer flavour," he says. Thirty-­four-­year-­old Giorgio Soldatini and his sister have also begun producing "riserva" or "barrique" grappas by ageing the alcohol in wooden barrels. His young friends used to be scared of grappa, he says, because of its "reputation as a soldier's drink", but he has managed to convert them. This may be partly thanks to the 35 varieties of grappa currently produced by Distilleria Gualco - the Soldatini family business, now in its sixth generation - including one infused, unusually, with milk and lemon. In other countries, grappa has also tended to be seen as a poor, unrefined relation of the spirit world - too fiery for most palates and stomachs. Another family business, Bortolo Nardini, the first to make grappa using steam distillation back in 1779, has been working hard to alter this perception by promoting it as a cocktail ingredient. Fulvio Piccinino's book of cocktail recipes, Futurist Mixology, includes two grappa cocktails, including one called Grandi Acque (Great Waters), with equal quantities of four components: grappa, gin, kummel (a liqueur flavoured with caraway, cumin and fennel), and aniseed liqueur. "For a long time, the export market represented not even 10% of our total sales. Right now it's about 25%," says Antonio Guarda Nardini, managing director in charge of export. Like Distilleria Gualco, the Nardinis also produce a variety of different grappas, with alcohol content ranging from 40% to 60%, some aged in Slavonian oak barrels, others infused with rue or other aromatic herbs. All can be sampled in their historic grappa bar in Bassano del Grappa, near Venice, on the corner of the town's landmark Palladian bridge. Fulvio Piccinino believes grappas like these have the potential to find a place at the world's coolest bars. "Five years ago I was working in a hotel in Piedmont and the Russian and Chinese were mad about grappa," he says. He says several distilleries are now starting to export to China and Japan. Germany has been interested in grappa for a while and, until Moscow imposed an import ban on food from the EU - in response to European sanctions over Russia's support for rebels in Ukraine - Russia was also a growing market. "Russians drink a lot but they always drink something that tastes of nothing: vodka. When they discover grappa they are stunned," says Piccinino. As for the gin- and bourbon-drinking US, he believes breaking down grappa's negative image as a harsh stomach-burner will be harder but not impossible. "It takes time... like vermouth, which is now very fashionable in America. 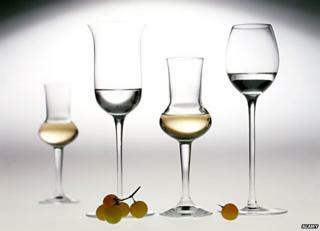 I think grappa could be next."